Cape Fear Press was established in 2001. Jennifer Page is the owner and holds a BFA from East Carolina University with a concentration in photo etching. Jennifer worked in NYC for 3 years following graduation making photo etching plates for various artists including Robert Motherwell, Peter Max, Richard Prince, Tom Wesselman, Lorna Simpson and others. Her main specialty in printmaking is photo intaglio etching and traditionally etched processes on copper. Cape Fear Press started out in 2001 by introducing Puretch Photopolymer, a high resolution, significantly less toxic, dry film resist to replace the highly toxic xylene solvent based liuid resists like KPR and Rockyphot. Jennifer became interested in Photogravure in the early 90s while living in NYC and started experimenting in a non climate controlled garage studio around 1994 in NC but did not fully learn the process until much later. In 2010 she heard about a replacement tissue for the discontinued Autotype tissue. Jennifer learned the process while systematically testing the new pigment papers which came without any processing guides. Learning the process (with the aid of the Kolb and Crawford books) on new and unknown tissues forced her to experiment to realize the ideal processing for each tissue versus what was recommended for previous tissues. These new gelatin papers with their own unique characteristics required her to thoroughly test each variable of the process which lead to a solid understanding of each tissue and all aspects of photogravure. Jennifer finds the scientific and alchemical aspects of these processes just as challenging and compelling as the creative side of the work. She is constantly researching and experimenting in the studio/lab to improve the processes and materials used to make these photographic etchings. Her focus is to use the latest technologies in conjunction with time tested traditional processes, aiming to to make the best photo intaglio prints possible. 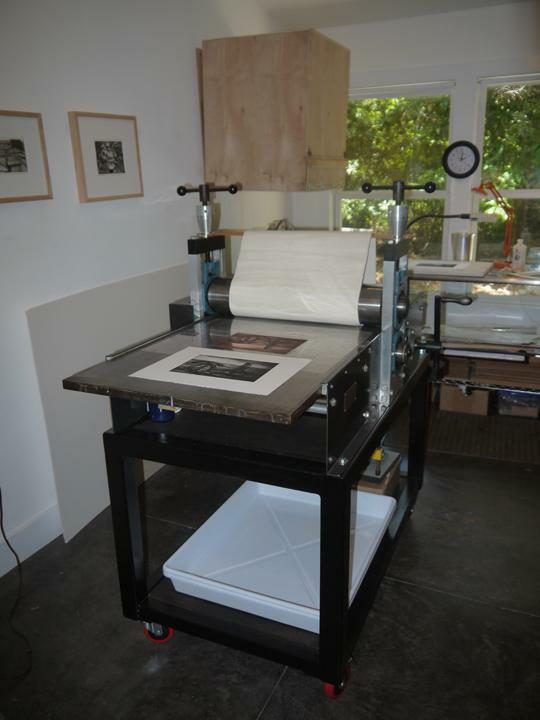 Jennifer also makes her own analogue aquatint screens and grayscale inkjet inks for digital transparencies which has enabled her to have complete quality control of those facets of the photogravure workflow. Cape Fear Press also hosted three large scale steamroller woodcut printmaking events in downtown Carolina Beach for the years of 2009, 2010 and 2012 called Big Print Block Party. This was the first steamroller printmaking event in the Southeast. The faculty at UNCW are now keeping the tradition alive with Print BIG! and Cape Fear Press assists with the planning and steamroller printing of their annual event. Jennifer has been teaching the photo etching process since 1991 and photogravure since 2010. She exhibits her work nationally and internationally.